Omelettes are very easy to get wrong. The main reason for this…….using bad supermarket quality eggs….full stop. A classic French omelette is nothing but egg, seasoning and butter therefore there is absolutely nowhere to hide if you have bad eggs. 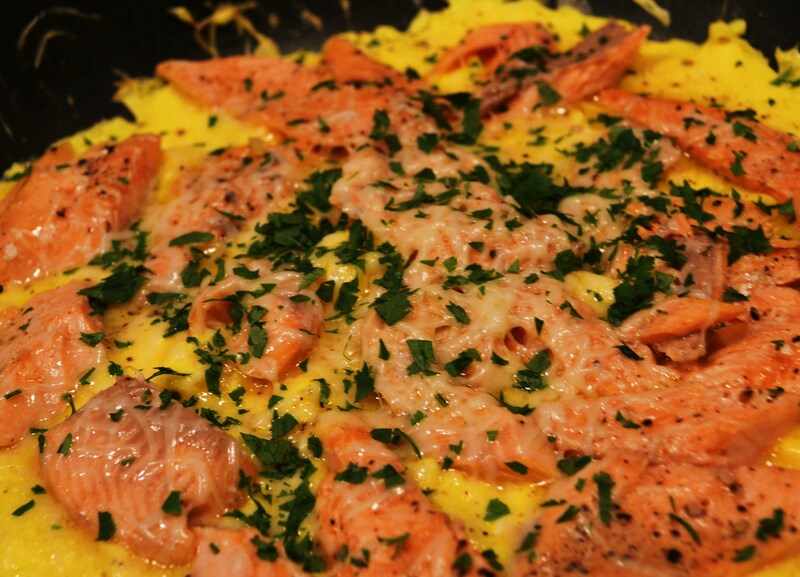 This recipe was inspired by my head scracthing whilst peering into the fridge – nothing looking back at me but some fresh rainbow trout and 6 eggs from my Dad’s chickens…….and some parmesan. If you have ever worried about omelettes and making them, then don’t – use a medium heat and you’ll be fine. High heat and you gona struggle. Step1: Kick off by melting the butter in a shallow frying pan (or an omelette pan of you got it), combine the eggs and cheese and beat well, you want as much air in there as you can get. When the butter starts to froth and turn slightly brown then pour in the eggs. Step2: Next, just simple work the egg mix around the pan until it starts to cook out but remains runny ontop. Lift if off the heat and scatter over the flaked fish, add a final scattering of cheese and sling under a grill for a coupel of minutes….just until the top of the omelette is set ….just set and no more! Step3: You can serve the omelette in the pan or fold it out and serve it with a cool salad of rocket and spud salad!